The Gerry & Franca Mulligan Foundation provides an annual scholarship, awarded to a Juilliard School of Music jazz student, with preference given to saxophone players or composers. 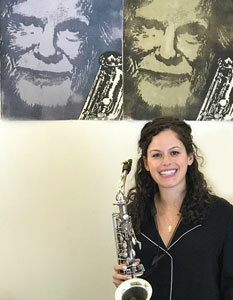 For 2019, this award was given to Juilliard saxophonist Alexa Tarantino. Tarantino is a graduate student at Juilliard and has performed all over the world including at recent concerts in the Middle East. The 26-year old has released one CD and is working on her second. Along with her studies and performances, she is the founder of the Rockport Jazz Workshop in Massachusetts. The two-week program has expanded in a few short years to 120 students. For more on Alexa, visit https://alexatarantino.com. In addition to awarding the annual scholarship, Franca Mulligan donated one of Gerry’s prized baritone saxophones to the school. Juilliard holds a special annual Tribute Concert at Lincoln Center to celebrate the “Gerry & Franca Mulligan Scholarship”, featuring the Juilliard Jazz Orchestra performing Gerry’s music. Tarantino recently visited Franca Mulligan, President of the Gerry & Franca Mulligan Foundation, and Jim Mageras, its Music Director, at Gerry’s studio in Darien, Connecticut, where she played two of Gerry’s standards: “Line for Lyons” and “Bernie’s Tune,” the second of which she played on Gerry’s own alto saxophone. About the foundation: The Gerry & Franca Mulligan Foundation is a 501 (C) (3) foundation, established to provide music education to young musicians, donate musical instruments to inner city schools, and perpetuate the music of Gerry Mulligan for educational purposes. The foundation passionately and profoundly believes that music education supports all learning from language development, social skills, and improved test scores.